Yesterday was a hard day for medical marijuana advocates across the country. We defeated several local initiatives banning dispensaries in California and Colorado and (fingers crossed) our "NotCooley" campaign provided the narrow margin necessary to ensure victory for California Attorney General-Elect Kamala Harris. But voters rejected statewide medical marijuana initiatives in Arizona, Oregon and South Dakota, while measures to increase taxes on medicine in California won. And of course, the US House of Representatives is now in the hands of dangerous politicians who do not share our vision of safe access. We have never had so much to lose and our fight begins today! It is more important than ever that we work together to protect the gains we've made and fight even harder for what we know is possible. Americans for Safe Access (ASA) needs your support now more than ever. The national landscape for medical marijuana has changed, but our course remains the same. Since 2006, Americans for Safe Access (ASA) has been working full time in Washington, DC to: 1) Put an end to federal interference with state medical marijuana laws, 2) End the ban on clinical research, and 3) Create a plan to guarantee safe access for the entire nation. That work is ongoing and we will not stop until all Americans have safe and legal access. But we cannot do this alone. This year, I traveled all over the country to meet patients and advocates and I am deeply moved by your commitment to safe access. Unfortunately, I am also shocked by how few of you engage regularly with your federal representatives. If you are not meeting with them, then they are only hearing about medical cannabis from our opposition. These election results mean we need to fight harder! With your help, ASA can be ready for new challenges and bigger victories. Together we can stand up to our opponents in Congress and prepare for 2012 and beyond. Can you make a contribution to ASA today, so that we can keep fighting? We must be our own liberators; no one is going to do our work for us. Republican Party control of the House of Representatives may make our work more difficult, and that’s why it is more important than ever that ASA bring an educated and empowered constituency with real solutions to the table. We have to show the new Congress that patients’ voices cannot be ignored! That is the only way we will get policymakers to bridge the divide between federal and state laws regarding medical marijuana. ASA will continue to work on Capitol Hill and with the Administration to improve the federal government's understanding about medical marijuana, as well as both the immediate and long term needs of our members. We may have lost several battles yesterday, but we have not lost the fight by any means. We’ve become used to working hard to defy the odds, but we need your supportright now to keep making a positive difference in the lives of patients. Join the fight today and help us make that difference! Over 3,392,000 voters, perhaps including you, expressed their disapproval of the current system of criminalization and their support for legalization. They expressed hope for a safer, more rational society where a personal choice is treated as a freedom, not a crime. The “L” word, “legalization”, has become acceptable. You saw and heard a public debate the likes of which has never occurred in California, or in the nation. It became respectable and normal to discuss legalization. This time we didn’t win. But we will. The local and national media coverage of Prop 19 was extensive. And it featured and highlighted LEAP speakers, especially Joseph McNamara, Stephen Downing and Jim Gray, who appeared on television commercials, public service announcements, radio interviews, blogs, and in newspaper articles and columns. LEAP speakers Russ Jones, Kyle Kazan, Nate Bradley and Diane Goldstein made appearances that drove the message of legalization home. LEAP was anywhere people wanted us to be--in other words, we were everywhere. You can count on us to be present wherever legalization is up for debate. Our presence reflected your support of Prop 19, and your support of LEAP. We knew that win or lose, our involvement would continue. If it won, the federal and state government would make every effort to stop, challenge and otherwise drag down its implementation. We look forward to crossing that bridge. We are proud that Prop 19 achieved what it did with LEAP speakers’ support, and are confident that it would have achieved significantly fewer votes without us. It just means that we have work to do between now and 2012. And believe me, there will be an initiative in 2012. And with your support, it will win. Thank you again for your support of LEAP and Prop 19. Your donation will help us continue to fight for the cause. Arizona: Proposition 203, which would bring a working medical marijuana law to the state, is too-close-to-call at the moment, as tens, if not hundreds, of thousands of additional ballots remain to be counted. MPP will continue to closely monitor the outcome of this proposition over the coming days. California: Proposition 19, which would have made the personal possession and cultivation of marijuana legal and would have allowed regulated distribution systems on the local level, did not pass. It did, however, receive a very respectable 46 percent of the vote. South Dakota: Measure 13, which would have protected seriously ill South Dakota residents from arrest and prosecution for using medical marijuana with their doctor’s recommendation, was ultimately rejected by voters. Oregon: Measure 74, which would have established oversight and licensing requirements for medical marijuana dispensaries in Oregon, was also defeated by the voters yesterday. This loss, however, does not in any way affect Oregon's existing medical marijuana law. On a positive note, two gubernatorial candidates with good positions on marijuana policy reform won their respective elections. Peter Shumlin in Vermont and Dan Malloy in Connecticut both have positive outlooks on marijuana decriminalization, giving those states a leg-up when it comes to passing positive marijuana-related laws in the next several years. Incidentally, Shumlin also supports dispensaries, which are not currently a part of Vermont's medical marijuana law. California: Two of two dispensary bans were defeated in California local elections. Additionally, Kamala Harris is currently maintaining a slim margin of victory over drug-warrior Steve Cooley in the California race for attorney general race. Massachusetts: Nine of nine public policy questions asking legislatures to vote in favor of taxing and regulating marijuana like alcohol passed. Nine of nine public policy questions asking legislatures to vote in favor of medical marijuana legislation passed. Colorado: In 42 cities and counties in the state, voters were asked whether medical marijuana dispensaries should be allowed in their locality. Citizens in eight of these regions voted to allow the dispensaries. Wisconsin:Two of two referenda asking the Wisconsin legislature to enact medical marijuana legislation passed. We've all seen the election results by now, and while some may feel disappointed, I believe now is the time for us to look ahead. 2012 is closer than it seems, and with marijuana-related issues now firmly entrenched in the national consciousness we have an opportunity to forge ahead and make 2012 the most successful year we've ever experienced. But we can't do it alone. Of the nearly 100,000 people who will receive this email today, less than 6,000 have donated to MPP's work so far this year. If you and the other 94,000 people who have not yet donated each gave just $10 to MPP today, we would generate nearly $1,000,000. That's money that we can put directly toward ending marijuana prohibition sooner, rather than later. Ending marijuana prohibition is a matter of 'when,' not 'if' and every dollar you donate helps bring that 'when' closer to today. Help us bring Latino voters to the polls in California for Prop 19 - chip in $5. Or click here to volunteer to call voters for Prop 19. We've received urgent requests from Hispanic community leaders for a Spanish language version of our phone banking tool to help get out the vote for Prop 19, and we need your help. Polling shows that when Latino voters learn that Prop 19 will save tens of millions of dollars in incarceration costs, those who oppose the measure overwhelmingly become supporters. But if they don't hear the message, they'll never know. Can you chip in $5 or more to help us get Latino voters to the polls tomorrow? If you can't donate, we still need your help. Thousands of activists have called young California voters for the past month, and their votes are critical to whether Prop 19 will pass or fail. Or, sign up to make calls yourself to young California voters for Prop 19. We need your help to pull it off in these final hours. The entire country is watching what happens in California. Let's show everyone that the people who want an end marijuana prohibition believe passionately in the cause, and we're willing to fight every step of the way to make it happen. KPFT is one of the 5 Pacifica "sisters" and was the birthplace of the DTN which now has 94 broadcast affiliates in North America. For a pledge of $50 you can get Oaksterdam T's and sweatshirts, Ed Rosenthal's latest: Pot Growers Handbook, CD's, DVD's and more. A pledge of $200 gives you a choice of any 5 items. For more than 9 years we have broadcast the "Unvarnished Truth about the drug war". Please show you support by listening live to 90.1 FM in Houston or live on the web at www.kpft.org on Sunday, Oct 31 from 6:30 to 7:30 PM central time. Our in studio guest will be John Lomax, a reporter for Houston Press and we'll feature segments of an interview done with Kent University professor of criminal justice Alex Stevens. "Movie Night" tonight, on the widely-read Firedoglake.com blog, will feature Jeff Meyers, producer of the classic and now re-released video about hemp pioneer Jack Herer, and Emperor of Hemp director Jeff Jones. Tune in between 8:00pm and 9:30pm. We have just begun offering Emperor of Hemp -- the new Memorial Edition -- on our web site with donations of $15 or more. Visit http://stopthedrugwar.org/donate to place your order. 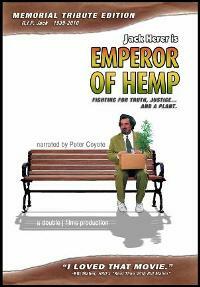 Visit http://www.emperorofhemp.com to learn more about the Emperor of Hemp DVD, and about Jack Herer himself, the justly renowned Emperor. In case anyone didn't make the connection, Firedoglake is the group providing a phonebanking web site to help you support Prop 19, and the three state medical marijuana initiatives, by doing get out the vote phone calls. All you need is a phone and Internet connection, and you can be volunteering for these important efforts now! Click here for further information. It is crunch time in Arizona. With just six weeks to go in the medical marijuana ballot initiative campaign, powerful people in the state have joined together to prevent patients from using and acquiring their medicine legally. The campaign is working hard to keep pace but we need your help. As a supporter of marijuana policy reform, you know how hard it is to change marijuana laws. Amazingly, we are now on the cusp of making medical marijuana legal for the citizens of another state. We cannot fail. Working with individuals like the notorious Sheriff Joe Arpaio of Maricopa County, a group called Keep AZ Drug Free is spreading misinformation throughout the state. And now they have received a contribution of $10,000 from the Arizona Cardinals professional football team. The Cardinals get sponsorship money from beer companies and are using it to prevent patients from using a far less harmful substance! Disgusting. We cannot let hypocrites like this succeed. We must match them dollar for dollar. If you can help us raise $10,000 for the campaign, they will be able to put more volunteers to work distributing materials and holding signs. And they will be able to mount a more aggressive earned media campaign. Please make a contribution or $5, $10 or more to the Arizona ballot initiative campaign today. And celebrate with us six weeks from today when we defeat the powerful and make marijuana legal for the patients. SSDP Heads Back to School! The 2010 fall semester brings with it SSDP's largest chapter network to date. SSDP now has chapters on 135 college campuses throughout the U.S., and we expect to reach nearly 200 chapters by early 2011! We're also holding five regional conferences across the country and will be hosting our first training conferenceat the University of Maryland in March. A donationof $100, $50, $25 or $10 to SSDP will help us provide materialsand resources to our chapters so that they can wage successful campaigns on and off their campuses. Please consider making a one-time donation or signing up as a monthly sustainer and donating as little as $10 per month to SSDP. If you can't support us financially right now, you can help us grow by spreading the word and telling a friend about our Action Alert list, becoming a fan of us on Facebook, joining our Facebook Cause, and by following us on Twitter, YouTube and Flickr. We have officially launchedour "Just Say Now" campaign with Firedoglake.com, one of the world's biggest political blogs, to combine their online presence with our grassroots organizing strength. Together we will be working to identify supporters of marijuana reform across the country to get them engaged in the battle, while simultaneously attracting the attention of the nation and the world. Sign the petitionand make a $10 donation to get your awesome Just Say Now sticker! Through the Just Say Now Campus Challengeour chapters are competing to see which school can gather the most signatures. SSDP's outreach staff has launched a revamped student organizing manual, arming every SSDP chapter and activist with guides on lobbying, working with the media, running productive meetings, organizing successful events and much more. Your donation of $20 will pay for 10 manuals to be printed and shipped to chapters! Help Us Reach 10,000 Fans on Facebook! SSDP is excited to be holding our first three-track training conference aimed at delivering chapter members with intensive participatory workshops and trainings on campaign management, running a chapter and lobbying. Can you make a donation to SSDP today? Read it On the Web. The last few months, we've told you about the strides we're making to ensure everyone has safe and legal access to their medicine. We told you about the grassroots base we're building, the impact cases we've filed (and won!) and the many, many services we offer to patients across the country. Still, we haven't been able to renew your membership. Take a moment to watch this video. We hope it inspires you to renew your commitment to our movement and renew your membership to ASA. We are in a unique political climate that has a window of opportunity we're not likely to see again, and ASA will act on it; but we cannot afford to lose the support of a good friend like you. Click here to renew your membership today. We really need you with us this year.